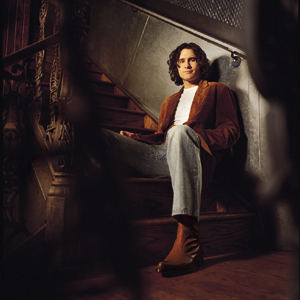 As everyone who hears his amazingly rich and mature baritone instantly realizes, classic country music has always formed the home, the heart, and the soundtrack of Joe Nichols’ life. "It starts when you’re a kid," he says. "It’s like dreaming of becoming a fireman, or anything else: You want to be great at something. For me, it was country music; that was what I cared about. It’s like growing up with certain foods, or a favorite blanket, or shirt, or fabric: Later on, you want to re-identify with whatever it is, more than anything else." Nichols was raised with an older brother and younger sister in Rogers, Arkansas, a medium-sized small town near Fayetteville. In this "suburbia, but without a big city nearby," as he recalls it, Nichols’ mother was a single mom and his father drove a truck but also played bass and sang; Nichols would hear and watch his dad perform at VFW dates. Like Nichols’ grandfather and uncles, his dad played classic country music. "Their kind of country," Nichols remembers, "was the music I’ve always liked to listen to, my favorite records: George Jones, Merle Haggard, Marty Robbins"
At high school in the 90s, Nichols’ friends had other favorites. "The people I hung out with were into the pop culture, which at the time meant a lot of rock and roll that was extremely popular: AC/DC, Motley Crüe, and so on. Of course, I thought they were cool. But their music, well, I couldn’t really get it. I could hear it was good. But as far as being passionate about it as music, I couldn’t." So Nichols started tuning in to songs by the 80s and 90s heirs of the Jones-Haggard-Robbins tradition, artists like Randy Travis, and Alan Jackson. "They had real cool voices and finished sounds. They were right in the tradition. But in their music, everything was fresh." phrases, is Man with a Memory, Nichols’ Universal South debut, precisely. Produced with a straightahead excellence by the noted Nashville guitarist Brent Rowan, the collection presents brand-new country music so passionately considered, played, and sung that it has no need whatsoever for any sort of add-ons. "The music Brent and I record," Nichols says, "has a simplicity to it; it’s so simple, in fact, that it¹s kind of difficult. You know how on some records a guitar player, for example, will start playing something tricky? It’ll be like he’s saying ‘Hey man, check me out’." We paid our musicians not to over-play, not to hot-dog; we wanted every note to matter. There are no check-me-outs." Instead, there are a dozen songs, each sung by Nichols with guts and polish, that testify in diverse ways to the ongoing vitality of classic country. "The Impossible", a ballad with a gospel-like fervor, chronicles the great long unpredictable sweep of sometimes difficult life as a man implores with a woman not to give up "on you and me," even though "the fury of the wind" can be harsh. A cool groove, "Brokenheartsville", proceeds at a more chipper pace, as a girl and her new boyfriend drive off in a Cadillac while her ex bitterly drinks a twisted toast to her future. "She Only Smokes…", traces the plight of a woman who lights up only when she drinks, which usually happens when some guy’s broken her heart. It’s a new honky-tonk tune, as are more upbeat songs like the foot-loose "Joe’s Place", which celebrates a bar with "pickled eggs in a jar" as well as a jukebox packed with great old tunes. Then there’s "Everything’s A Thing", one of the album’s three songs that Nichols co-wrote. It’s a way cool bluesy jaunt that wrestles with knowing, as Nichols sings, that "It’s all laid out/ In the scheme of things/No matter what it is/Everything’s a thing." Man with a Memory is exactly the album Nichols moved to Nashville to write and sing, the one that had been in so many ways in the making since he was an Arkansas kid. "People like me," he says, "grew up listening to stuff from a long time ago, and they haven’t forgotten the sound, the style. The songs don’t have to be about anything unrealistic right now; they can be, for example, about driving around in a boat on a lake. The subject matter may not be about riding horses and shooting guns, but the sound of classic country, it still deals with the homeland, the heartland, even if that’s in the form of today’s suburban life." After doing the usual round of jobs that most aspirant young country singers hold down, from moving furniture to installing cable TV systems, Nichols hooked up with Rowan three years ago; Brian Spradlin, Nichols’ best friend and guitar player, then working at a cartage company, moved equipment for Rowan, and he kept insisting to Rowan that he meet with Nichols. "Brian probably made a nuisance of himself," Nichols recalls. "Brent finally listened, and called the next day." They saw things similarly, the sessioneer extrordinaire who had played on scores of big-time Nashville records and the terrific young singer who had read the guitarist’s name on credits for years. "Brent and I wanted to make a record that we would buy," Nichols says. "We wanted to feel that we would turn in a record where there would be no compromises, no saying well, I’m not sure about this song or that song. We wanted twelve hits, really, that would all be contenders. I love hit records; I just want to be singing them." He will. "The core of your songs and music," Nichols says, "needs to be about what you know, what you feel. You can spice it up, flavor it, add this or take away that. You can add colors, make it modern-sounding, make it different, unique, or off-the-wall. You can, I believe, add things to classic country without making the core of it vanish. You can wear any kind of clothes that you want to wear, you can put on this or that. But that classic country base, that’s what I’m always going to come home to. Because that’s where it is for me."